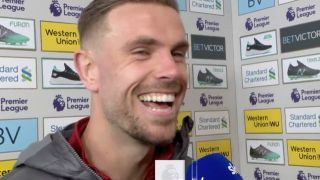 Liverpool midfielder Jordan Henderson revealed what Jurgen Klopp’s message at half-time was to inspire them to a win over Chelsea. Despite dominating the first half and creating plenty of chances, the Merseyside giants couldn’t find a breakthrough as they knew they had to respond to Manchester City’s win earlier in the day. It didn’t take long to rectify that in the second half though, as early goals from Sadio Mane and Mohamed Salah had Anfield rocking, as they secured a 2-0 win to go back top of the Premier League table. Naturally, something must have been said during the half-time interval to focus Liverpool on how to break Chelsea down and win the game, and Henderson has revealed that it was a relatively straight-forward message that Klopp sent the players out with. “Keep going, keep doing the right things, we need to create better spaces for each other,” he told Sky Sports. While the players are ultimately the ones that have to go out onto the pitch and execute the game-plan, it starts with the manager and with so much on the line, Klopp can’t get it wrong at this stage of the season. Henderson’s insight suggests that it doesn’t necessarily have to be a passionate or frustrated message to the players, but merely simplifying things and showing belief in the team to eventually get the job done by encouraging them to do the right things. The title remains City’s to lose as with their game in hand, they can return to the top of the standings and stay there if they win all of their remaining outings. However, Liverpool are certainly doing their part as they continue to pick up wins, while they will switch their focus to the Champions League in midweek as they hope to secure a spot in the last four by seeing off Porto.